The southern channel of the mouth of the Amazon lies just north of Belem, and as such, the city is known as the Metropolis of the Brazilian Amazon Region. Belem is also known as the city of the mango tree, or Cidade das Mangueiras, due to the large number of mango trees in and around the city. We anchored in the middle of the Amazon River and were required to take a local ferry- boat from the ship to a small dock shore-side. 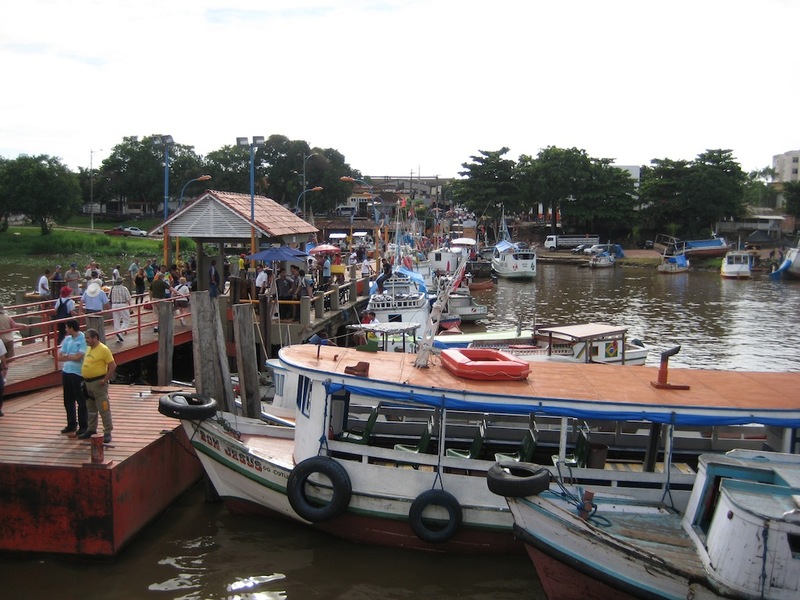 The dock was about a 45-minute drive from the downtown of Belem. The dock area was filled with colorful wooden boats and ferries used for fishing and transporting locals from one town to another. Young men were selling fish and live crabs on the dock. Fruit stands lined the street selling pineapples as well as other fruits and vegetables. Trash littered the shoreline and the water is a hot chocolate color from all of the silt that moves through the river. From the mouth of the river, the silt is carried some 200-miles away as the huge volumes of fresh water mix with the salt water of the Atlantic Ocean. The streets were in poor condition with many potholes, litter and a collection of stray dogs. Our tour today was an Arts and Culture of Belem tour where we could get an idea about everyday life in Belem. The tour was included in our travel package and was a tour of only eight people in a small van. Our drive to the town of Belem took us along a coastal road where there was a beer brewery, a naval academy, an army academy and many unkempt businesses and homes, many with graffiti painted walls. Our Signature representative and her husband were good to arrange our early tender off the ship. However, she seemed to be a little confused/ditzy. She left without money and had to borrow some US dollars from Kent; didn’t know when to get out of the van at a tour site and seemed more interested in her shopping than managing the tour. 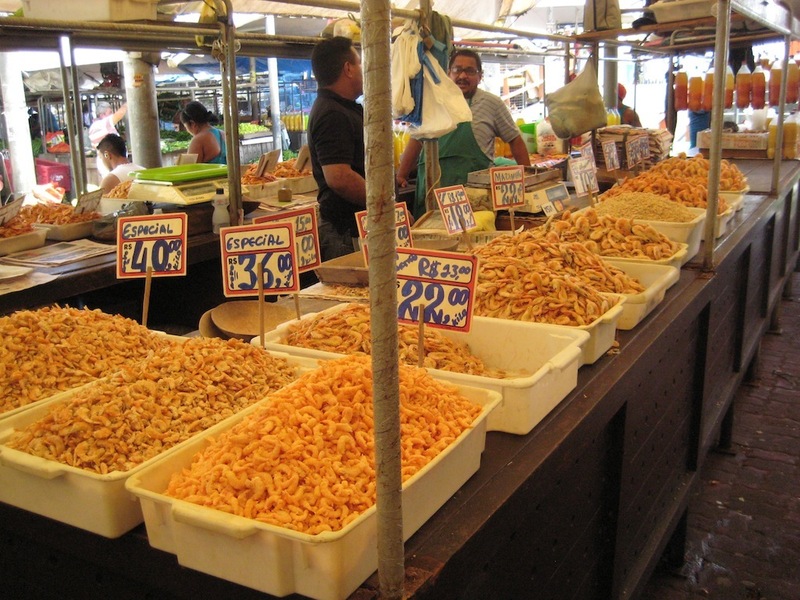 Once we arrived in Belem, we drove through the city to reach the Ver-O-Peso Market (Check-the-Weight Market), a huge outdoor market that sprawls four city blocks. Begun in 1688, as a result of the Portuguese tax for everything entering and leaving Amazonia, it is the city’s best-known landmark and possibly the largest market in Brazil. The market sells most everything that you might need from fruits and vegetables, seafood, live ducks and chickens, handicrafts, clothing, pottery, prepared foods, juices, a natural viagra and more. We had the opportunity to taste the cocoa fruit, dried shrimp, fresh Brazil nuts and a couple of local fruit juices. Nearby the market, we visited the Forte do Castelo, a fortress built by the Portuguese in the 17th century. It is located on the edge of the river and served to protect the new colonies against attacks by Holland and France. On the site of the fort was a small museum showcasing many of the artifacts uncovered from within the walls of the fort, including pottery, utensils, tools, coins and canons. Across the street from the fort stands the Basilica of Our Lady of Nazareth, which is an elaborate copy of St. Paul’s Basilica of Our Lady of Nazareth in Rome. Built during the rubber boom at the beginning of the 20th century, this church is a fine example of beauty and architecture with a central nave, stained glass windows and a lovely altar. 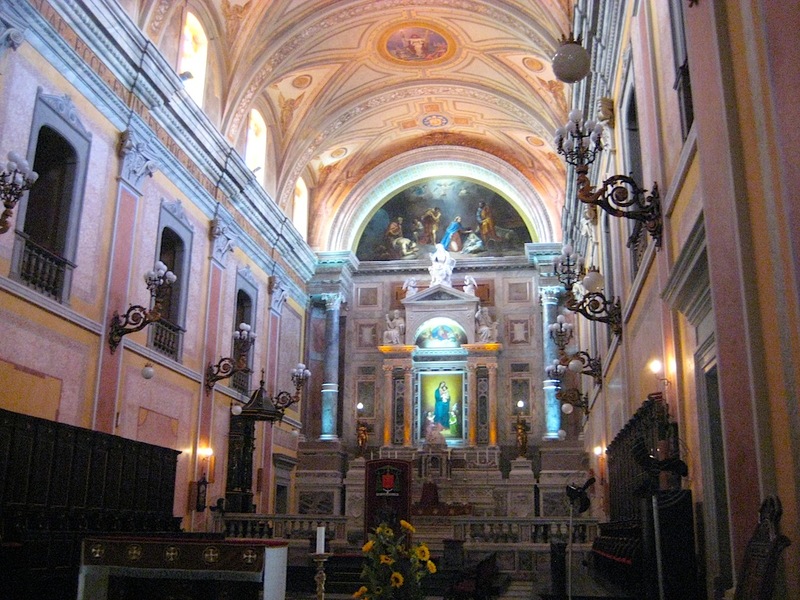 The church has been beautifully maintained and is in extraordinary condition inside. Our next stop was the Sao Jose Liberto former jail, now a handicraft market, and the Jeweler Polo Gems Museum displaying more than 4,000 pieces of diamonds, quartz, crystals and amethysts. This once overcrowded jail holding more than 40 people per cell was closed and the population relocated to a larger jail. The building was then completely renovated and turned into a beautiful museum with gorgeous outdoor courtyard, performance hall and handicraft market. 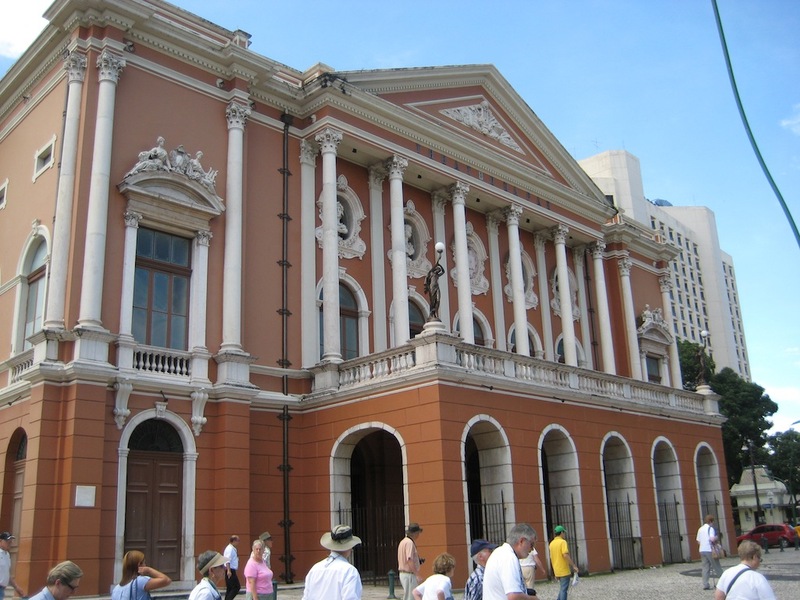 Our last stop was the Da Paz Theater, considered to be one of the prettiest in Brazil. It was built in the neo-classical style and was opened in 1878. Beautifully maintained, the theater is reminiscent of something you would find in Europe. The lobby was decorated with hand-painted walls imitating wallpapers of Europe and the entry floors were beautifully tiled with original mosaics. The theater built in a horseshoe shape with four stories of balconies and box seats facing a large stage with red velvet curtains. The ceiling was exquisitely hand painted, the floors throughout the theater were done in a light and dark wood parquet, and the seating was all made of cane. Upstairs on the second floor we saw a stunning ballroom used for dancing. Around the perimeter of the ballroom a second floor narrow balcony with wrought iron railing was reserved for the servants of those attending the ball. The help was kept accessible in case they were needed but they were not allowed to mingle with the guests. The seating capacity of the theater was about 882. During the late 1800’s and early 1900’s, Belem was a thriving community, prosperous because of the burgeoning rubber industry. Much of the city’s architecture during that period was copied from French examples. Unfortunately many of these gorgeous old buildings have not been maintained and today they are covered in mildew from the heavy rains and many have not been painted in years. Many of the main city streets are lined with three story row homes-style buildings with elaborately ornate window trims and architectural details. Hopefully one day the city will be in a position to restore many of these buildings and bring back some of the prosperity of the past. Belem is located very near the equator so the weather is very warm and humid. Most everyday of the year, it rains for all or a part of the day. It had rained all day yesterday, but today we lucked out and it did not shower until late afternoon when we were back onboard and sailing for Devil’s Island. The entertainment on this night was a second performance by the very talented Marionette artist Phillip Huber. He brought to the stage a whole new collection of nine more puppets including an opera singer, a contortionist and an Asian warrior who performed the face changing dance, before changing into a dancing dragon. It was fascinating and entertaining.